Halloween is a fun time of year but can also present danger in many forms to our animals. We want to enjoy ourselves and keep our precious fur-kids safe in the process. Glow sticks and all types of glow jewelry (bracelets, necklaces, rings) are not deadly but can certainly cause pain when the glowing liquid is ingested. Cats, especially, tend to find these products quite enticing. Once chewed, the chemicals can cause redness, swelling, discomfort in the mouth, often leading to hypersalivation and frequent drooling. You and your family may be planning on dressing up for the holiday, as costumes are the essence of Halloween. Although it may be adorable and amusing to see your Golden Retriever in her best clown ensemble, many dogs and cats find wearing various shirts, masks, and other outfits to be petrifying. Signs of anxiety in dogs can be hard to detect and can include yawning, licking of lips, tucked-back ears, maintaining a stiff body posture, and avoiding eye contact. Food can also be particularly dangerous for our pets at Halloween. Chocolate presents a major hazard, depending of the type and amount eaten. As a general rule, the darker the chocolate, the more methylxanthine it contains. If mild amounts are consumed, you may observe general gastrointestinal upset, including nausea, decreased appetite, vomiting, and/or diarrhea. As more of this chemical is ingested, cardiotoxic effects are seen and the animal may develop seizures and potentially fatal abnormal heart rhythms. Additionally, we need to worry about animals getting into raisins/Raisinets on this holiday, as they can cause acute kidney damage. There are often no obvious clinical signs of ingestion until it is too late, so please try your best to keep them out of reach of animals. Similarly, if you tend to hand out fruit to your trick-or-treaters, consider leaving grapes in the refrigerator. The toxic amount of grapes that an animal needs to eat in order to get extremely sick varies widely from pet to pet. Sugarless gum and other sugarless candies can pose a major danger to your pet, as the Xylitol they contain can cause serious hypoglycemia (low blood sugar) and liver damage. Finally, it is very important to plan a ³safe zone² for your pet ahead of the Halloween festivities. Because animals are often spooked by frightening costumes (pun intended) and decorations, they can pose a flight risk. It is best to keep an identifying collar on your dog and let him rest in a quiet bedroom or isolated area far away from the front door. You may also consider placing a sign on the front door asking people to knock rather than ring the doorbell. Many dogs become rather upset when they hear this noise time and time again. 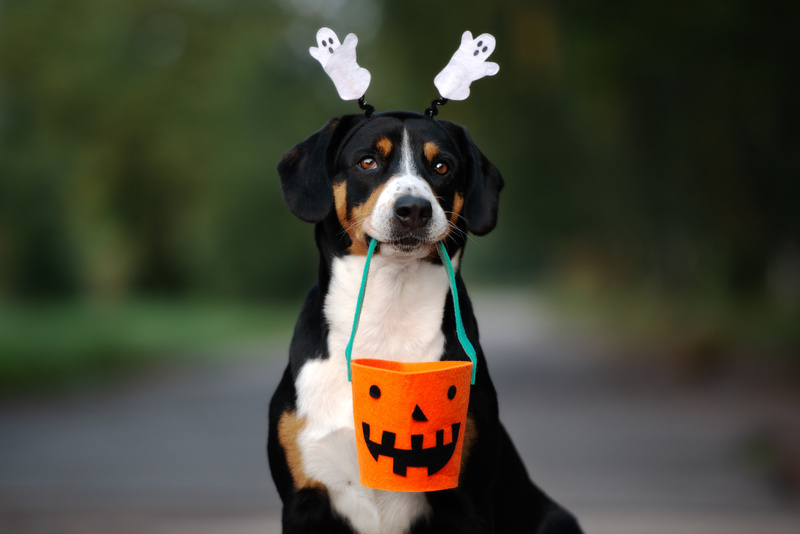 In trying to prevent the anxiety they develop with people in costume, try to walk your pet well before and after the designated trick-or-treating times in your town. During this Halloween season, help keep your pets healthy and protected from the dangers that lurk. Should you have any concerns, please call us at Mount Laurel Animal Hospital (856) 234-7626, or call ASPCA Poison Hotline immediately (888) 426-4435.